For this, a barbecue is necessary for the full, authentic flavour. The high intensity of the charcoal grill gives the roasties their smoky, charred flavour. 1 Get your barbecue going. Preferably in the garden. 2 Bring your potatoes to a boil from cold water in a saucepan. Allow them to cook through, then cool them and cut into one-centimetre slices. After that, toss them in the olive oil and add a pinch of pepper. 3 Lay the potatoes on a double layer sheet of foil and tuck in the crushed garlic cloves and sprigs of thyme. 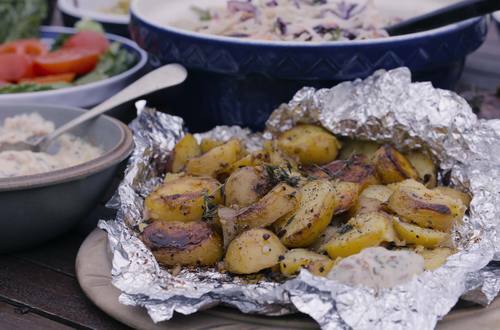 4 Seal the foil up tightly to make a neat parcel and pop them on your perfectly heated barbecue (no flames please) for thirty to forty minutes, turning the parcel over occasionally, using tongs. 5 Make the dressing, by mixing together the sundried tomatoes, mayonnaise and chives. Season with pepper. 6 When the barbecue potatoes are sufficiently roasted, rustic and ready, tip into a bowl and top with the dressing. 7 Ideal to serve with steak, but also fresh tomatoes and salad. Remember to always treat the piping hot spuds with care at first.